Savour the exotic flavours of Middle Eastern Cooking with Sasa's Corner, multicultural caterer to Sydney's west. Here are some freshly made sweets from our kitchens, complete with yummy fillings and secret spices! Perfect as a tea time treat or dessert, served with fresh mint or cinnamon tea. For catered meal orders of $200 and more a complimentary sweets plate is provided to satiate that sweet tooth! Our sweets plates start at 30 pieces, a complete list will be on our re-designed menu, coming soon. An Array of Multicutural Flavours! Hello and welcome to Sasa's Corner, multicultural food caterer to Sydney's West. 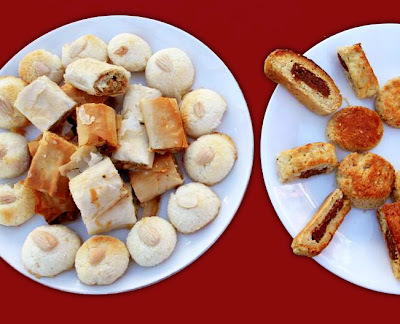 We specialize in fresh and healthy Egyptian and Middle Eastern dishes and sweets, but we are also known for providing tasty food of many nationalities including Indian, Greek, Lebanese and more. We cater to homes and businesses and provide a menu to suit any taste or budget. Stay tuned and follow this blog for interesting posts, mouth-watering photos and information on how you can get in contact with us for a free quote. - Kind Regards, the Sasa's Corner Team. Food is important to Egyptian culture and to my family. When we have a celebration we always cook together and it's always fun. We are happy to work with you to develop a delicious menu and great price to suit your needs. We require a minimumum of 3 working days notice for all orders. Orders placed at 12pm or later require 3 days per order from the following working day. Delivery available upon request, free in certain suburbs. Catering for groups from 6 people to 120, any occasion or celebration we customize each order to suit your taste and budget. Full payment must be made on delivery, cash only at this point in time. Thank you for visiting Sasa's Corner. Copyright © 2012 Sasa's Corner Pty. Ltd. All rights reserved. Simple theme. Powered by Blogger.